Let Us Beat Swords into Plowshares by Yevgeny Vuchetich, donated to the United Nations by the Soviet Union in 1959. 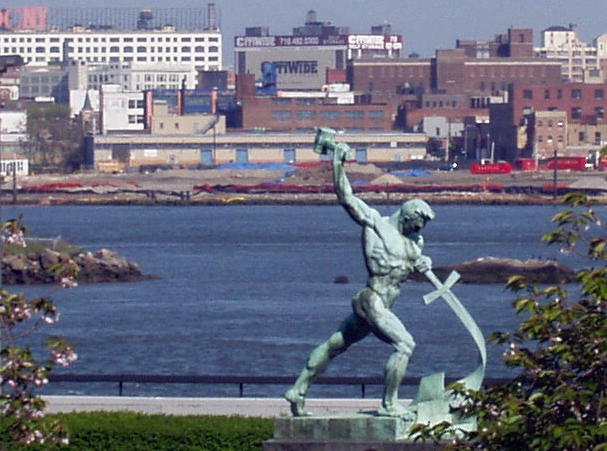 Photo taken by Pharos from UN grounds showing sculpture in front of the East River, CC BY-SA 3.0 via Wikimedia. You must either make a tool of the creature, or a man of him. You cannot make both. ...that great art, whether expressing itself in words, colours, or stones, does not say the same thing over and over again... Yet... this is... only hidden from us... by false teaching. Nothing is a great work of art, for the production of which rules or models can be given. ...but love of order has no more to do with our right enjoyment of architecture or painting, than love of punctuality with the appreciation of an opera. I daresay that Ruskin, if he were writing today, would be regarded as "discursive". But I like his style. There is so much that underpins his work, a depth of reading that is obvious, yet creates the scaffolding for his originality; political, yet not radical; radical, yet not revolutionary; revolutionary, yet not wanting to overthrow the status quo; accepting of change, or more importantly for my own thinking, of the punctuated equilibrium of living and civilisation, but all moving toward an end where men (sic) no longer wage war, having learnt to live peacefully (much like the literal truth-speaking "long-livers" in George Bernard Shaw's Back to Methuselah). I must admit that the portrayal of John Ruskin in Mr Turner corrupted my imagination, and I pictured a lisping flatterer who was socially-tolerated, yet privately thought a fop. But now having read Ruskin "in the flesh", I am inspired, and, in addition to finding another guide to so many things I enjoy (landscape painting, Clark's Civilisation, Turner's art, etc), I have developed a new appreciation for the role of the critic.